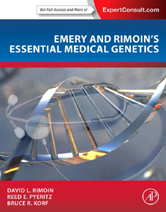 Editor/Author Rimoin, David and Pyeritz, Reed E.
For decades, Emery and Rimoins Principles and Practice of Medical Genetics has provided the ultimate source for practicing clinicians to learn how the study of genetics can be integrated into practice. Developed in parallel to the sixth edition, and featuring 174 original contributions from the many authors of the full set, this one volume work expertly condenses and synthesizes the most clinically relevant content, for convenient desk reference. Helping to bridge the gap between high-level molecular genetics and individual application, it follows the multi-volume set in encompassing scientific fundamentals, full spectrum discussion of major inherited disorders, and actionable therapies. Clinically oriented information is supported by concise descriptions of the principles of genetics, research approaches, and analytics to embrace the evolving population of students, researchers, and practitioners who are integrating their work to provide advanced diagnosis, prevention and treatment of human disease.